Hello lovely readers(if there's anyone actually left!) and happy new month! So as always, long time no see! But with the arrival of the new month and the year coming to an end, I thought maybe this is a good chance for a fresh start! So, on with some sewing news, as I mentioned before I've signed up for pattern drafting lessons! I couldn't be happier with my decision! Since then my relationship with sewing has got a totally different dimension. Now I' m able to understand design elements, dart placement, fitting and all these features that once were so strange to me. We covered everything for skirts to different bodice variations and we dipped our feet slightly in the oh-so-scary pant making pool with learning how to draft culottes. This is the first version I made and I have three more coming! They feature both front and back darts. a fly-front zipper closure and have an ankle length. For these I used a fuschia-red crepe fabric. They come together pretty easy and as it was my first time doing a fly front zip closure, I'm quite proud if I can say so myself! The only problem was that they come out a little tight around the dreaded belly area, something that I corrected in my next versions! All in all I'm really happy with the outcome and really excited to do more drafting. I paired my culottes with my Astoria sweater from Seamwork magazine. I made version 1 of the pattern in size M without any alteration. For these photos I've turned the waistband to the inside, but I think I'm going to omit it and just hem the sweater, because I prefer the length without the waistband. I used a white medium weight rib knit for this one. It came together pretty quickly and I'm happy with the final result, I just wished I've made version 2 with the longer sleeves. Oh well, there's always next time! So how about you? 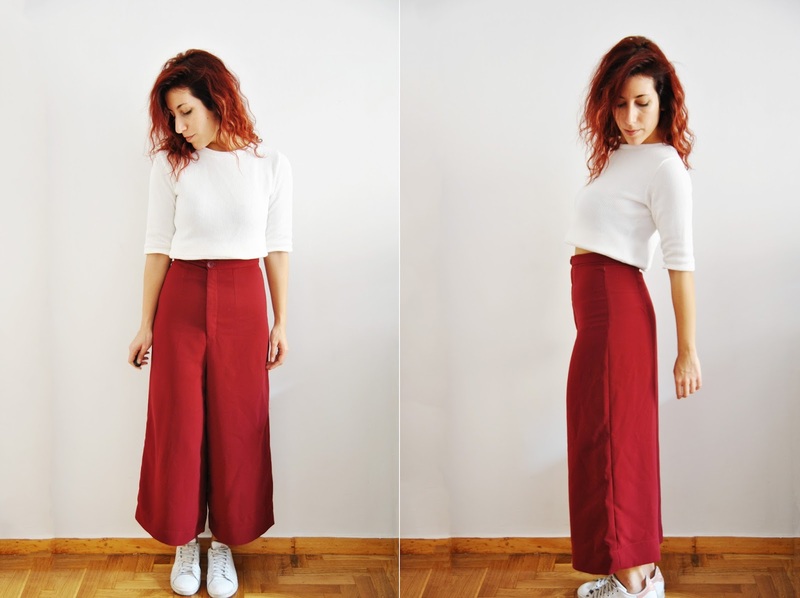 Are you fan of the culottes trend?